The market of gaming laptops is very dynamic and filled with manufacturers that put out new models almost on the weekly base and confuse customers even more. Most of them consider themselves the best of the best, as thinnest, fastest or cheapest. So, if you are looking for some gaming laptops you are in the right place, as we have put a list of top 5 best gaming laptops just for you. It is less than an inch wide, and it is still amazing. It seems that Asus has introduced a new gaming laptop’s category with this device. This happened because they had some help from nVidia, especially from their MAX-Q technology. Republic of Gamers had built a firm, innovative and fast gaming notebook that is not much wider than a usual Ultrabook. Actually, the only difference is shorter battery life, which can barely stand two hours of active gaming. Still, this is a next-gen gaming laptop that all users can count on. In conclusion, this is an extremely powerful and innovative notebook, with futuristic design, quiet cooling and admirable display and speaker. But we also have to mention its flaws and that is just poor battery life, with a lifespan of 2 hours when playing. Also, they could have done a better job with ergonomics and keyboard design. Most of the gamers imagine ASUS when they hear a word Ultrabook, but now Razer Blade can counter that phenomenon. When you get your hands on the Razer Blade, you will notice a great performance laptop, with 7-hour battery life, when in usage. Although some will think differently, we have to say that graphic performances could be done better, for the standard model. But, they were nice to most needed gamers, and they provided and option to improve graphical performance with external GPU add-on. 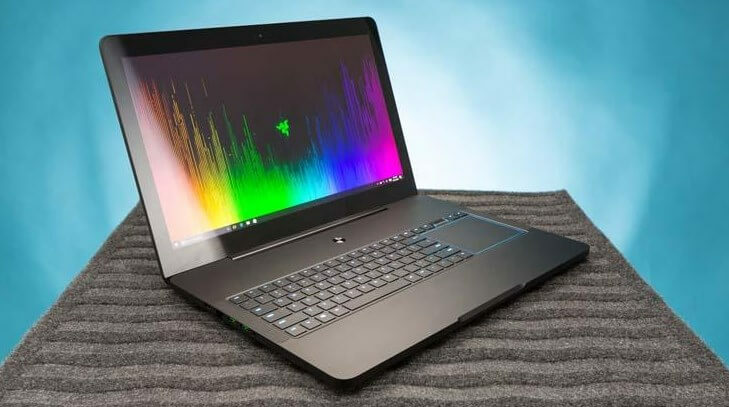 To close it down, Razer Blade is a gaming-ready rival to its competition, with its features like long battery life, which can withstand over 7 and half hours of gaming, and it has an option of a 4k display. As for the cons of Razers masterpiece, we have to tell that it has loud fans when under hard usage, and it is a little poor when it comes to upgrade options. It is difficult not to like a gaming laptop such good. The Asus ROG Strix GL 502 maybe does not have the coolest design, but it is, with any doubt, one of the best gaming laptops available, when it comes to 1080 HD gaming. You can actually play games; such as Overwatch, on ultra-settings, and have your FPS locked at least 60. It has a mid-range battery, which is not one of the better components of the laptop. Asus ROG Stix GL 502 is one of the better ones in competition, with having a great performance on HD gaming, it has colorful, lively display. It does have a weaker battery, but so do most competition does, and you can get this one with a lower price than rest of competition. Alienware made a first-ever full OLED technology gaming laptop. Unlike most of the gaming laptops its size and performance, this little machine has an „overlap” design. Also, by having coolers moved behind the screen, the frame is allowed to be thinner as well. It also has a big OLED display, as we said, with 13-inch display, so finding a matching bag for this thing will be a bit of a problem. To wrap things up, this model features innovative OLED 13 inch display, which most of us finds exclusive and advantageous. It has a better price than most of the competition and it has cool and futuristic hinge-forward design. And as for the drawbacks, we must mention short battery life, and dense in some of the laptop parts. Razer blade PRO was built with an idea of desktop replacement, with a focus on mobility. After a long period of waiting, Razer has introduced us with a real desktop computer replacement, that won’t let us down. Razer blade PRO gives you options to choose, whether you prefer a full HD display, that can run on 120 Hz, or maybe 4k resolution touchscreen. They were also innovative, introducing first-ever “mechanical keyboard“for a laptop. Razer Blade PRO features his most powerful “base” setup, and it is made an ambitious idea. It offers as much power and performance as desktop machines, but still, keeps its a thinner frame design and it has longer battery life than most of the desktop replacements. Main problems are that it still has a bad battery life, and it is way more costly than all competition. If you’re in the market for some different tech devices feel free to check out our other top 5 lists in the same category.